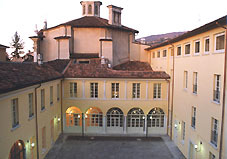 The department of Mathematics and Physics "Niccolò Tartaglia" of the Università Cattolica del Sacro Cuore (UCSC) in Brescia is the research structure of the Faculty of Mathematical,Physical and Natural Sciences. The teaching activity of the researchers is organized in four degree courses (bachelor and master) in Mathematics and Physics. In these courses are also present two additional formative programs in environmental sciences and in information technologies. The researchers take part as teachers in the Ph.D courses in Mathematics, Physics and Political Economy and also in the post-graduate courses (master of I and II level), in the specialization courses and in the Alta Scuola per l'Ambiente (ASA) summer school. CRASL (Centro di Ricerche per l'Ambiente e lo Sviluppo sostenibile della Lombardia) focus its research activity and investigation, on the relationship between human behaviors and environment from the point of view of Natural Sciences, Economy and of Human and Social Sciences. Ecometrics work in the field of research and environmental advice. The research lines and the academic activity highlights a strong technical-scientific partnership with the governmental institutions, with the economic and social entities, with the high schools world and with the cultural operators in Brescia as well as in Lombardia. A lot of agreements has been activated in the last years for the development of scientific research applied to economy, technology, environmental problems, technical advices and for projects related to governance and to sustainable development. The department belongs to a network of important international research centers as witnessed by the european and international research projects and by numerous publications in prestigious international scientific journals.